Life's a Drag - Frock Magazine for crossdressers, transvestites, transsexuals and transgender people everywhere. Oh, and Drag artistes too! Life’s a Drag is the story of intersecting lives, cultures, and communities. It all begins when Roz and Jamie trade the hustle-and-bustle of downtown London for the quiet life of Suffolk village. Jamie wants them to fit into their new home, so he throws all caution to the wind, wins the village’s annual drag competition. With the burden of planning next year’s event on his shoulders, he starts looking for ways to use the contest to help preserve the town hall. Meanwhile, across the world in San Francisco, Drew, Saul, and Elliott are facing the gradual decline of their lives and their livelihoods in a fading drag scene. At first glance, taking home the title of UK Drag Queen of the Year seems like just what they need to boost business, until Drew connects with Jamie and discovers the small town truth. It is not quite the high publicity event he was hoping for, but it may be something even more valuable. Here are two communities in need, separated by class, culture, and geography, with only two things connecting them – honey bees and drag. It takes some convincing, but Drew convinces his crew to fly to Suffolk and compete in the contest, with the deal being that Jamie and the Suffolk gang will fly back to San Francisco after to put on a club show. While I went into the story expecting more of a farce, I was delighted to find how much of a story there was behind it. In fact, it is not until halfway through the book that the whole cultural exchange is arranged, leaving the actual clash of drag queens for the books final chapters. Before we get to that point, Janie Millman does a lovely job of establishing the two communities, drawing us into her character’s lives, and making us care about both their causes. There is, of course, a lot of fun exploration of gender and gender roles here, and I loved the contrast of amateur and professional drag queen styles. They may have different skills, different senses of style, and different abilities to pass, but they share the same passion and pride in their performance. 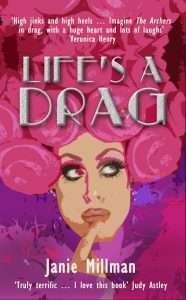 Life’s a Drag is comic at its heart, but it is also romantic, dramatic, and rather thoughtful at times. It is a story that thrives on the strength of its characters, both good and bad, and which just has a feel-good atmosphere throughout.